Love me some shredded chicken from the Instant Pot. I love how hands off these recipes are, and how well the flavor is infused into the chicken and sauce as the food is heated and pressurized inside the EPC. 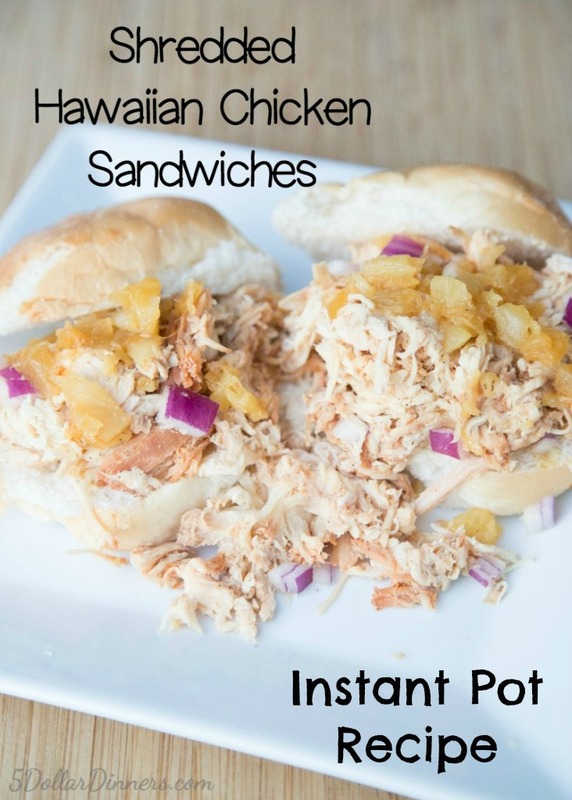 Instant Pot Shredded Chicken – 10 Ways to Make It!! And if you haven’t yet, check on my Electric Pressure Cooking 101 Online Class! It will help you get over your fear of using your EPC, help you expand on the food/meals you’re making in your EPC, and equip you to be faster, more confident and more efficient in the kitchen! Learn more about Electric Pressure Cooking 101 here! Watch as we make shredded chicken LIVE on Facebook during our Dinner Made Easy Show…and then, we go on a ‘treasure hunt’ in my kitchen to find ingredients that I have on hand to make a great shredded chicken! 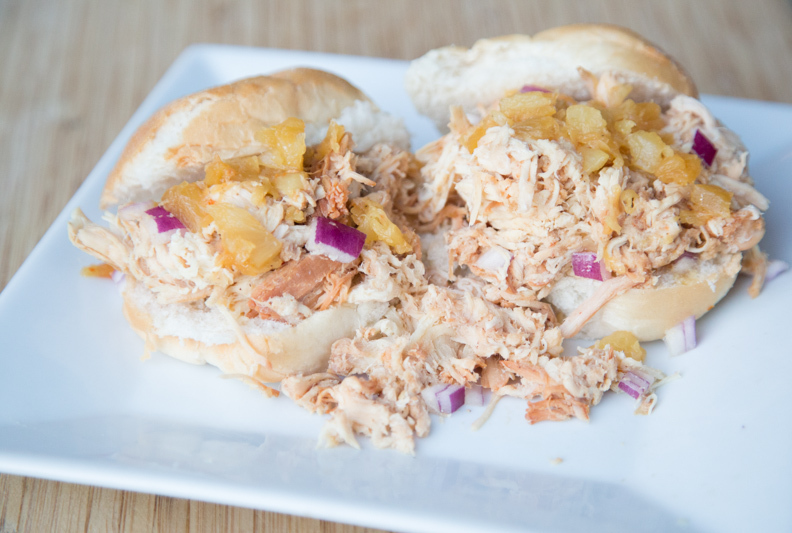 And this might just be my favorite shredded chicken recipe…. Place the chicken breasts into the electric pressure cooker insert with the hot water. Sprinkle a little salt and pepper over the top. Drizzle BBQ sauce over the chicken breasts and then pour the pineapple juices around the chicken breasts and the pineapple on top of the chicken. Once cooked, pull out the chicken breasts and the pineapple and add to a bowl, then shred with 2 forks. Mix in the chopped red onion, if you didn’t add it to the pressure cooker. Add shredded chicken and sauce to sandwich buns. This recipe is featured on SouthernPlate.com’s Meal Plan Monday #61. Thanks for all your Amazing, easy and low cost meal ideas!! I have a tip that has changed they way I feel about having to shed chicken! Instead of taking so much time using forks… Get out your electric hand mixer!! Put chicken in a glass or metal bowl… Or ceramic crock pot! Beat that chicken up with your hand mixer and whallah… your chicken is shredded and ready to go!! You’re Welcome!! Haha =) Super Easy and Fast!! It doesn’t say how much hot water to put with the chicken, unless I am just not seeing it. HELP! I also tried the recipe, and it didn’t say how much hot water. We put in a cup. We ended up with too much juice. I would say maybe a 1/2 cup next time. I would personally also add more barbecue sauce, maybe some cinnamon and nutmeg, and I’d put in the onion at the end. I used 1 cup of chicken broth, and there was plenty of liquid. You could probably get by with just a half cup water or broth. OH I am so going to do this, but in a slow cooker this summer. I have my own BBQ sauce recipe and paleo sandwich buns I want to use with it though. I think it could be a good paleo version of it! More work but worth it to me!